This classic garden vine welcomes spring in a big way with its dramatic show of fragrant blooms. Come spring, vines produce masses of large grape-like clusters (racemes) of bluish-purple flowers with an intense fragrance. Flowers are followed by large fuzzy seed pods and compound leaves. 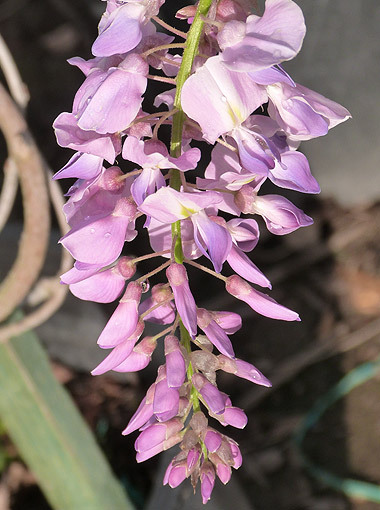 Varieties are available with flower colors ranging from white to pink to violet. Planting wisteria should be done only after serious consideration has been given to the location, available space and support structures. This beast of a woody vine can quickly overwhelm neighboring trees, shrubs and structures. Also, remember that vines are deciduous, meaning they’ll be bare through winter. If planted in shadier conditions near trees, vines will typically attach themselves to trees and grow very tall in order to reach more sunlight. Vines can damage trees. It’s best to plant wisteria in a full sun location, as a specimen vine that will be formally trained onto a sturdy pergola, arbor or wall. Plant in rich, well-draining soil. The best time to prune plants to control size or for training is mid- to late-summer, after blooming has finished.